Bitcoin has moved up a bit since the very recent decline. The SEC has just suspended two Bitcoin vehicles. The volume is pretty thin. Is a new rally budding? Or do these events point to a precipitous decline? Announced on Sunday, the U.S. Securities and Exchange Commission (SEC) has issued an order seeking to suspend the trading of the Bitcoin Tracker One and Ether Tracker One exchange-traded notes, issued by XBT Provider AB, a Swedish-based subsidiary of the U.K. firm CoinShares Holdings. In the official order, the SEC cited a "confusion amongst market participants" based in the U.S. as to the nature of the financial instruments as the reason for the move. The suspension is in effect as of 5:30 p.m. EDT today, and will last through 11:59 p.m. EDT on September 20. Further, trading on other, non-U.S. exchanges will not be interrupted during the suspension, the release suggested. The principal reason are inconsistencies in the descriptions of the mentioned vehicles. These descriptions varied from ETFs to ETNs to certificates depending on the source. The SEC seems to have decided that such discrepancies could be misleading to investors and so it decided to suspend them, at least temporarily. There’s no great mystery to the SEC decision. The agency’s mandate covers such action and Bitcoin products seem to be on its radar. Bitcoin is not regulated enough for the SEC to view Bitcoin ETFs as safe and other kinds of products tend to be not mature enough or not clear enough to be marketed to investors. The lack of clarity is imperative in the discussed case. It will probably still take at least a couple of years for Bitcoin products to be approved by the SEC. On BitStamp, we have seen a rebound of sorts from the very recent local lows. Is there any momentum to the current move up? The move down pierced through three Fibonacci retracement levels based on the July rally – the 50%, 61.8% and the 78.6% one. Bitcoin has since come back above the 78.6% level but not the two remaining ones. The fact that the currency is still well below the 61.8% level supports the bearish case. The price moves, together with the elevated volume levels, have strong bearish implications. This is further reinforced by the fact that the RSI went down considerably but didn’t reach oversold levels, thus leaving room for more declines in the weeks to come. Quite importantly, Bitcoin erased the bulk of the preceding rally to $7,400 and it did so with a vengeance. A rally on declining volume is a bearish sign itself. When it’s followed by serious depreciation on elevated volume, the bearish implications are strengthened. Another factor to consider is the potential trigger for the move. The Goldman Sachs news is not a major game-changer for the entire Bitcoin market but the reaction to the downside was fierce. So, the currency might be magnifying bearish factors. This suggests the underlying fragility of the market and adds to the bearish case. Basically, nothing changed from the short-term perspective. 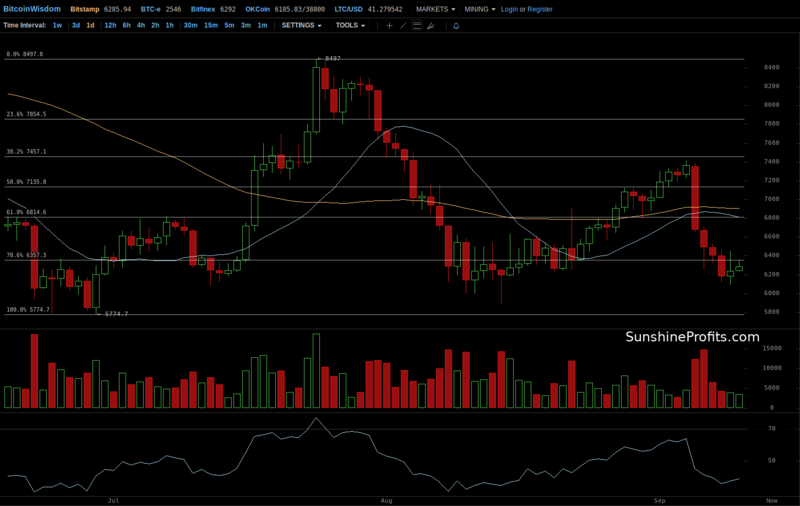 Bitcoin hasn’t even gone above the 78.6% retracement. It tested the level but didn’t hold at it. In fairness, the currency is pretty close to this level and we could see a move above it but the current situation rather supports the view that we are seeing a pullback to the broken retracement and the failure to move above it suggests that the outlook remains bearish, in our opinion. On Bitfinex, the current action to the upside is almost not discernible. Actually, it confirms the bearish outlook. If we look at levels based on the February rally, Bitcoin went down below the 78.6% Fibonacci retracement level, the last level before the February low at $6,000. This is a bearish piece of news. At the moment of writing, the currency is almost exactly at the April low (which is slightly above $6,400). 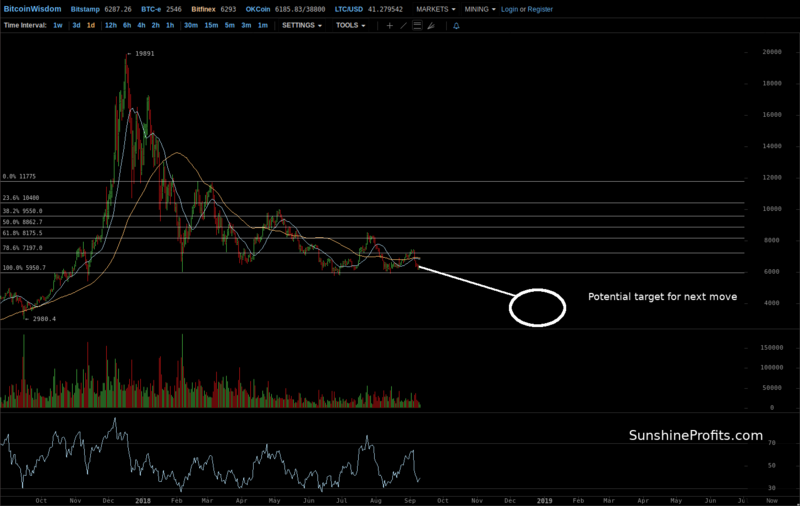 This means that both the February low ($6,000) and the June one (above $5,700) are very much in sight. Another factor to consider is that if we treat the peak of the recent rally as a local top (around $7,400), then Bitcoin is quite consistently forming a series of lower tops. This pattern is visible even when we track Bitcoin tops from the all-time high around $20,000 onwards. Such a pattern is a bearish indication and it is rarely more bearish than precisely at a time when a local top might have been formed. If we take a look at the RSI, we get yet another confirmation. The index might have just topped and such tops were consistent with local tops in the currency in the past. At the same time, we don’t see an extreme oversold reading, which suggests that Bitcoin might still have room to fall. At the moment, the most probable outcome for Bitcoin, in our opinion, is a move down to the $6,000 level (February low), either followed by a brief rebound or an immediate breakdown below this level. Even if a rebound is seen, it might be volatile and quickly reversed to the downside. This means that even if we see a rebound, it might not be the best idea to exit the market or go long as the subsequent decline might be quite strong. All in all, the situation remains firmly bearish and our profitable hypothetical (...) positions might become even more profitable. The points we made previously are very much up to date. From the long-term perspective, Bitcoin is still very close to the $6,000 level. So, Bitcoin hasn’t managed to break above the 78.6% and the move below $6,000 still looks like the more probable option, in our opinion. Again, the recent depreciation has been quite significant, so we wouldn’t be surprised by a volatile move up but such a move could be reversed very quickly and followed by more declines. Right now, the outlook is still bearish and Bitcoin is in a position in which even a small trigger could potentially result in significant depreciation. And any move below $5,400 could then result in a precipitous decline as there are no significant resistance levels from this level down to around $3,000 where the November 2017 low is located. In other words, in our opinion the most probable outcome in this situation at the moment of writing is still strong depreciation in the next couple of weeks or, possibly, months. Stay tuned! Summing up, in our opinion the volume has died down and the bearish indications remain in place. If you have enjoyed the above analysis and would like to receive free follow-ups, we encourage you to sign up for our daily newsletter – it’s free and if you don’t like it, you can unsubscribe with just 2 clicks. If you sign up today, you’ll also get 7 days of free access to our premium daily Gold & Silver Trading Alerts. Sign me up!